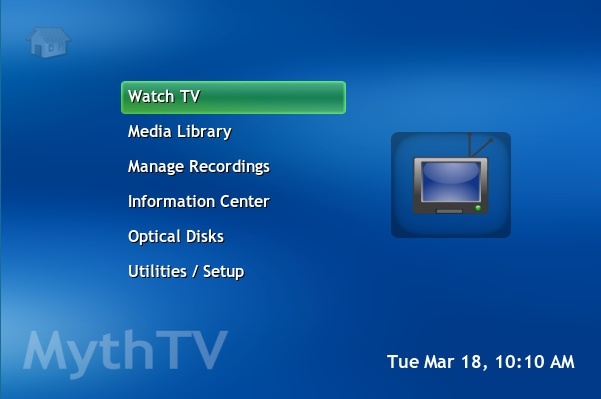 This section explains what you can do with a MythTV unit, how the parts work and how to control them. Hopefully, it will also identify things which can be done more than one way, and point out the most effective choice (and why you might want to do it another way anyway). 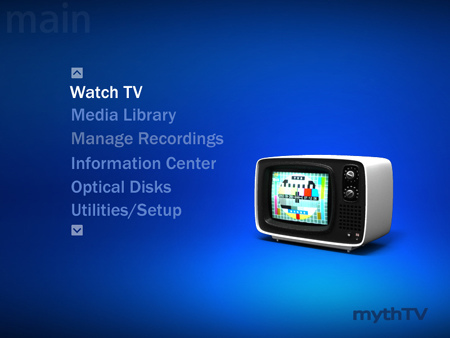 MythTV is a capable, powerful, and most of all expandable system. We will describe things which can only be done with, or will work differently with, an expanded configuration. Whether your screen will look exactly like the screenshots in this manual will vary depending on the theme you have chosen. The remote button icons represent common names for remote control keys. In reality, how these map to physical keyboard keys will depend on how your particular machine was configured. You will need to setup your Remote Control to suit. You can find a full list of keyboard keys and functions on the keybindings page. MythTV has been designed for the "ten foot Interface": it should be driveable from your sofa ten feet (3 metres) away. This is a compromise between functionality and simplicity--especially since the average Remote Control only has about 40 to 50 keys (10 of which are numbers), while MythTV has over 100 keyboard functions. MythTV users will also cite the much needed WAF or GAF; that is, Wife/Girlfriend Acceptance Factor. The good news is the 80/20 rule applies - you can do 80% of your day to day things with MythTV on about 20 keys on your remote. MythTV will shift your TV paradigm. Once you had to plan your time around your broadcaster's schedule, or sit channel-surfing just to see what was on, more often than not finding nothing you liked. MythTV introduces the Electronic Program Guide, or EPG, with its full description of what is currently being broadcast and what will be broadcast in the coming weeks. The guide is stored in a relational database so that you can make queries such as find episodes of "Desperate Housewives". MythTV watching is more like the way you would watch your DVD collection. You browse what is in your collection and watch what you want, when you want. However instead of going out and buying DVD's, you harvest your favourite programs as they are broadcast, record them to your hard drive and watch them as you want. MythTV has plugins that actually allow you to just look for broadcasts of your favourite films and, as soon as they are broadcast, record them to your hard drive to add to your collection! You can even have the system make recommendations and record them against the kind of shows that you like. Many long-term MythTV users will say that they have stopped watching live TV and are instead spending time each week scheduling the system to record the kind of shows they like and just browsing through their collection of shows and movies and watching what they like at their leisure. Some people like commercials. If you don't, MythTV lets you skip these in your recordings. As such MythTV is often compared to a TiVO. There is much activity in the industry with respect to commercial handling, and forcing users to watch these ie. you cant fastforward or skip these with Personal Video recorder devices or applications, indeed it may even become illegal to do so. Over the years MythTV has transformed itself into a full blown media hub, able to handle all digital media including photos, music, videos, DVD and CD plus much more. More importanly since the 0.20 release, MythTV is now able to support the new Universal Plug and Play (UPnP) media server/client and control point standard, so that it can interact with all manner of other media applications and devices. You may find it useful while reading the manual to refer to (or even print out) the Menu Maps for the front end and the backend setup program. MythTV consists of two main applications: MythBackend and Mythfrontend. Mythbackend handles all aspects of your TV cards and capturing live TV shows into recordings, and most importantly all the information about these recordings and any media you have such as music and photos. You will always need to start the Mythbackend first. Mythfrontend handles the user interface and the interaction between you, your remote control and the mythbackend server. Ideally mythbackend/mythfrontend should be autostarted when you power on your machine, see the user Manual:Detailed configuration Backend and user Manual:Detailed configuration Frontend on how to do this. Many users just leave their machines running all the time so that they can be sure to capture scheduled TV shows to recordings. For those of you that are concerned about electricity usage, then you can have your MythTV machine automatically wakeup just before a show starts, and then shutdown after the show has been recorded -- see the mythTV HowTo "ACPI Wakeup". The mythbackend server will automatically shut down when it is idle, ie is not connected to a front end, or is not recording. mythfrontend can be run either in full screen mode or inside a window. Once MythTV has started you will be presented with the MythTV Front Page. Here is one using the Retro Theme. You can see a collection of the available themes on the Themes page. Watch TV - Watch and record Live TV. Media Library - Watch previously recorded programs. 0.19 introduced the concept of a "welcome screen" so that the frontend could be started with a press of the remote control. This has been introduced for those people that want to use scheduled wakeup and shutdown to record scheduled shows to save on power consumption. Prior to this the Frontend would always start up which in turn meant that the backend would never shutdown when the recording had finished, thus defeating the whole purpose. Live TV can be accessed by selecting Watch TV from the main menu screen. This feature provides a way to watch TV through channel surfing at the time it is broadcast. 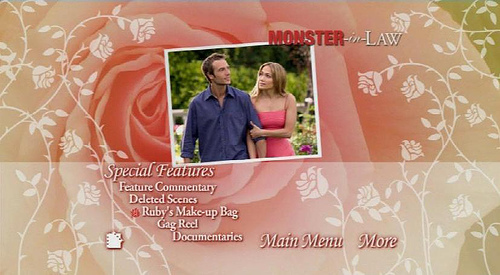 Since everything is recorded to disc, it is possible to pause programs, replay scenes, and store shows permanently on the system. In addition to channel surfing, it is possible to browse through TV listings using the Electronic Program Guide. Detailed information on watching live TV can be found in the Watch TV sub chapter of this manual. Shows that have already been recorded can be accessed by selecting Watch Recordings from the Media Library screen. Detailed information about watching recordings can be found in the Watch Recordings sub chapter of this manual. The Manage Recordings page allows the creation of new schedules, the viewing of upcoming recordings, and the deletion of old recordings. Detailed information on scheduling recordings can be found in the Manage Recordings sub chapter of this manual. Prior to the 0.19 release MythTV treated timeshifting ie chase play and recording a programme differently. There was a Ringbuffer that handled the timeshifting element, whereas Recordings were saved into their own file. This had some negative side effects. 1. If you were watching a live show and 15 minutes into it you decided that you wanted to record it, pressing the record key only recorded the show at that point. You lost 15 mins worth even though those 15mins were in the ringbuffer. 2. Changing channels was unnecessarily slow because the system had to mess around with the ringbuffer each time. With 0.19 Timeshifting and recording are one and the same. Now if you press the record button 10 mins into the show, all MythTV does is make a change in the database to indicate that this is a Recording and by magic it appears in your recordings collection. Live TV recordings that have not been transitioned appear in the Default Recordings group. If your machine starts to run low on disc space it will start to expire (delete) recordings to make room. The default behaviour is to delete oldest shows first, but there are other policies you can choose. A check for recordings that should be expired is made every 10 mins. The disc space threshold at which recordings start to be deleted is configurable. You can control most aspects of how recordings are expired in Setup->TV settings->General settings-> Global Auto Expire Settings. If you want to keep a recording around, you can mark it as permanent in the Recording Browser. Select the recording you want and press and select "Storage Options" and then "Disable Auto Expire". 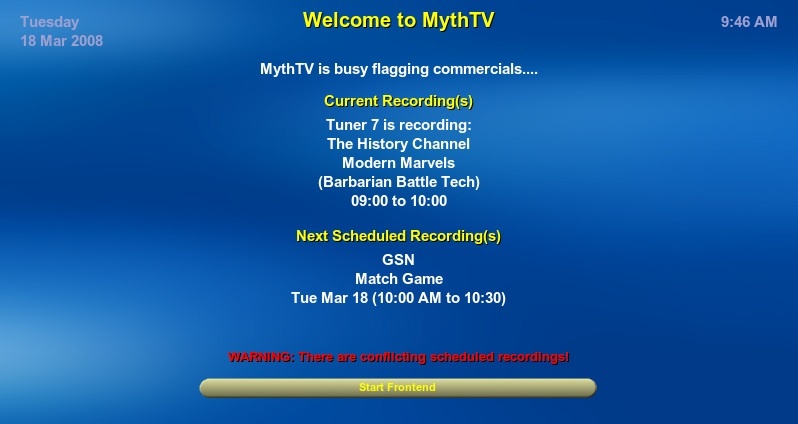 MythTV recordings are automatically flagged for commercials, ie there are markers put in the database that tell the system where it believes commercials start and end. This allows you to jump over commercials when playing back recordings. You can also use this information to delete the commercials when you export the recordings. You might find it useful to have a look at Commercial Detection which explains how it works. Normally, commercials are just detected so you can skip them, but not actually removed from a recording. If you're interested in permanently removing them, please refer to Removing Commercials. Detailed information on editing and transcoding can be found in the Removing Commercials page. Note: Should this section, and the following section "Exporting Recordings", be moved to it's own page, such as Archiving and Exporting Recordings? At some point you will want to archive your TV recordings for safe keeping. There are however some complications with this, due to the way Digital TV content is held on your hard drive. MythTV stores its recordings in the "/mnt/video" directory by default. You will find files in here with a .nuv or .mpg file extension and a long complicated name based on the recording schedule. These files are either in NuppelVideo format or MPEG-2 (Program or Transport Stream) format. To archive these files to DVD they will need to be either be transcoded if NuppelVideo format, or remultiplexed to specially formatted MPEG-2 files suitable for burning to DVD. MythTV 0.20 plug-ins now includes MythArchive for archiving your recordings. What follows is for users of MythTV 0.19 or earlier. A separate detailed guide exists for SUSE users at http://acaciaclose.co.uk/28654/124502.html. Project X takes a collection of DVB stream files and concatenates them into one big project. You can trim the files here also. It will then create synchronization marks between the audio and video. You can use the default settings. We now can convert the above output video (m2v) and audio stream (mp2) generated by projectX to a DVD compatible stream. We use the mplex command, which is part of mjpegtools. You will then have a .mpg file with combined audio and video all nicely synchronized. KDE DVD Author will allow you to create very nice DVD's complete with animated menus. You do not need to compile it. Just download and click on the installer.kmdr icon and KDE will install it. KDE DVDAuthor is a KDE Kommander application. 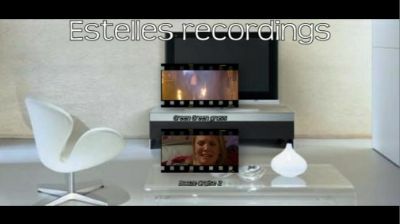 Just follow the steps in the wizard, adding in the video , audio and images files that it asks for. It wil then generate a DVD ISO image once it completes. K3b includes a wizard to burn DVD ISO images. You will find it under the Tools pull down. Tools -> Burn DVD ISO image. Just load up the ISO image from step 3, and you are done. MythTV recordings can be exported into multiple different formats such as iPod or PSP compatible MPEG-4 files, DivX and Xvid files, or files to burn to VCD, SVCD or DVD with the use of Nuvexport, which as of 0.21 is included in MythTV. It can also be downloaded from https://svn.forevermore.net/nuvexport/. Nuvexport is a command line program that can be used to create a copy of your recording in the following formats: Xvid, SVCD, VCD, DVCD, DVD, DivX, ASF, MP3, PSP, iPod, and MPEG-2 (though the iPod and PSP export options are currently unavailable). It does not alter the original file in any way, just gives you a new one in a folder of your choosing. When run, it will use information from the MythTV database to give you a list of all your recordings to choose from, and allow various options such as resizing the video, cutting out sections marked with MythTV's edit cut list, altering the bitrate, and various other things. A work in progress manual for nuvexport can be found at http://www.inaudible.co.uk/nuvexport. There is also a specialized script that allows you to transcode your files and subscribe to them on your iPod available at http://myth2ipod.com/. 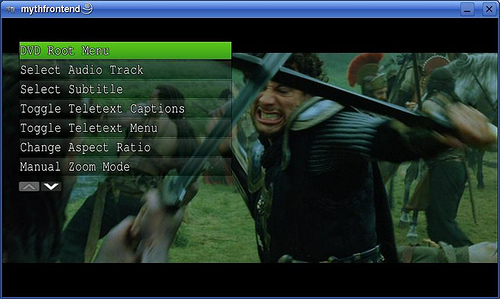 This utility uses nuvexport, and then does special post-processing with MP4Box to create an iPod-ready video. It will even generate an RSS feed for your shows, which you can subscribe to in iTunes. Currently (6/22/06) transcoding HD shows doesn't appear to work - you get rolling colors and disjointed sound. This is apparently a bug in nuvexport. SD shows work fine though. http://www.gentoo-wiki.com/TIP_MythTV_to_iPod is an alternative to http://myth2ipod.com/. While this how to is aimed at Gentoo users, it can be applied to any distro. Features include tagging files correctly (so they show up in TV shows instead of movies by default) and user job integration instructions. To play a DVD with the MythTV media player, simply click on Optical Disks >> Play DVD from the front page. 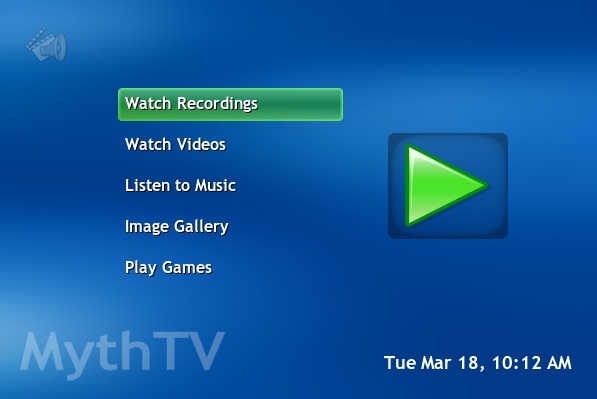 The MythTV media player has complete menu and subtitle support, as well as remote control behaviour and menus which are consistent with the those used when watching recordings. Press to bring up the DVD On Screen menu options. The MythVideo plugin provides the ability to manage and play videos of various formats with the help of external players. The MythGallery plugin allows you to view all your photos as well as short movies from your digital camera. It will show your photos as they are organised in your file system and generate thumbnails of both folders as well as individual photos. The MythMusic plugin adds the ability to manage and play music files on the frontend. The information center contains system status information and access to plugins like MythBrowser. A detailed description about the information center can be found in the Information Center sub chapter of this manual. For detailed information see the Frontend control socket article.